In my last blog I mentioned our new online enforcement penalty payment project which is currently in private beta. I am pleased to report that the service, now named pay a DVLA fine, has passed its GDS assessment and will soon launch in public beta. At the moment, customers who get a penalty because they haven’t taxed their vehicle or declared it off the road (SORN) can only pay their fine by calling our Contact Centre, or by sending us a cheque or postal order. 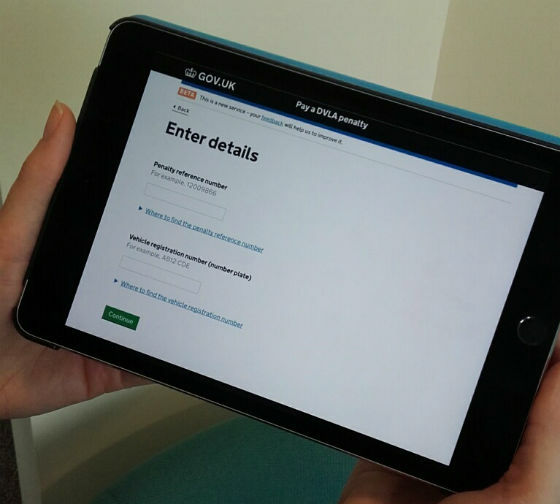 Our new pay a DVLA fine online service will give them the option of paying it quickly and easily 24/7. And with well over 1,200 customers having used the service so far in private beta, it’s already a success. In fact, more people have been choosing to use the digital service rather than paying over the phone. The service came about after DVLA’s first ever hackathon, where DVLA colleagues came up with the winning idea of ‘Pay your fine online’. Successfully bringing the service to this stage has been thanks to colleagues working together from across different parts of the Agency including insight, design and developers. By making it easier for our customers to pay their fine, it means further enforcement action is less likely, customers are able to pay any vehicle tax outstanding and it reduces the number of calls taken by our Contact Centre. Our long-term aim is to add more vehicle-related penalties to the service and encourage more digital take-up. What you should also do is to improve vehicle tax payments online so as to give people more options such as if they missed the direct debit pay they could just for the current month pay with a credit card if they have one or change the date of it or even to change the policy about the date you take the direct debit pay and always ensure it is on Friday because most people in UK receive their wages on Friday and so you will not be missing payments. Thank you for your feedback. This is something we are looking at as the aim of the Direct Debit scheme is to make sure motorists comply with the law and keep up-to-date with their tax payments. Will this mean you will start enforcement on SORN vehicles parked up, 3 outside my home and have been reporting them for months but nothing done. Hopefully this new system will make it easier for you to enforce getting them taxed or removed. Its about time with the technology available to not have tax payments based on a calendar month as now we have no tax disc for enforcement authorities to work from but registration plate reading cameras automatically detect a untaxed registration. Therefore it does not matter when the tax starts from as long as it is easy to find out when the tax has expired. The main advantage is when you change a vehicle the customer is not being ripped off by losing a months tax, part on the old vehicle and part on the new vehicle. I would like to know how many tens of millions of pounds this scam nets a year. If the government and politicians want to keep any respect it should not inflict scams like this on its captive customer base. Crooks and con men see things like this and vehicle crushing as making their criminal behaviour acceptable in their and their friends eyes. Best of all is no car tax, just add the cost to fuel tax after removing dvla and enforcement costs. Am I correct in thinking that it is still not possible to pay for such things as vehicle tax payments by on-line Bank transfer?